Subject: So.. Are you going to acknowledge the ripped off logo? To anyone looking, take a look at the slash marks through the wreath. This wasn't recreated as "parody". This was literally downloaded and and ripped into their artwork. It's straight up copyright violation. The Marvel one is a different pattern arranged in a circle. This circle is virtually identical to the one from Battle Royale, and the image in the center has similar slash lines through it, and it's called "Battle Royale"
Edit: On second look, the lattice circle isn't just the same looking, it is the same image. All of the slash marks are the same. They literally copy pasted it. That's pretty ridiculous. All the free technology in the world to design graphically and you've gotta go and steal someone else's logo blatantly? All the hundreds of unique created art should tell you that they have the will and skills to create new logos if they wanted. So it is obviously an intentional "modification" of a "known" or "seen" logo as a parody, just like the Marvel logo attached. 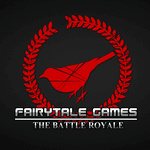 As the whole premise of Fairytale Games is a parody on the Hunger Games/Battle Royale phenomenon, I assume they are using the "fair use" clause of the copyright laws, which allows for extensive use of the original work. But it wouldn't hurt for them to modify it a bit more, similar to what Marvel did in their parody. Yeah it is a parody, that is the whole point. The problem is the wreath is identical to the one in Battle Royale. That is a copyright violation to use someone else's expression in commerce. You can see the slashes of the wreath are identical to where the slashes are in the Battle Royale logo. The Japanese company that owns the rights to the movie and logo may not notice or have an incentive to sue, but it strikes me as laziness rather than cleverness. The whole game idea strikes me as laziness. 'Eat It' sounds just like 'Beat It'! Although I am no expert I believe there are exceptions to copyright or trademarks rules for parodies in US. Although "parody" is a blurry concept, I am sure it applies here. So wait, first you aren't an expert, and then you claim that parody applies? It doesn't when you are directly using the same asset. Not being an expert in copyright or trademark law does not mean I can't have an opinion does it ? I base my opinion on what I read here and there, and yes I think this is a parody of "Battle Royale" (word which I can freely use as well as part of these trademark regulations) with a parody of fairy tales characters (not falling under copyright, as they are in public domain). However I recognised that the line between "parody" and blatant copy can be grey as seen with the Zombicide "Marvin" and "Bride" issue. "Parody" is the best way to avoid being accused of ripping things off. "Oh we just did it for fun" or "Oh we did it because we love the *original title*"
I don't know about the rules of the game (since I couldn't find much of it), but this doesn't seem like a "island survival where classmates/friends are forced to kill each other in a set limit of time or they would also die" game. If just using the word "Battle Royale" makes it okay to have a "parody" on the movie, then I guess this is the limit of a "team [that] consists of talented and creative individuals". And I guess it's okay for hundreds of other games that have some sort of death match to also copy the logo. No wait, those games didn't. Truth is, sometimes people will hide under the "parody" or "homage" banner to generate buzz or cut corners. There's not much you can do about it. I'm glad the OP recognized that, because it was the same reaction I had when I saw the logo for the first time. Now we wait for the designer to come out and say how this game was inspired by Battle Royale and thus he wanted to copy the logo. Funnily enough, I hadn't registered their logo until this thread. Even seeing it here it doesn't ring any bells for me. Is it really a huge part of their marketing? How about if the game was a "survival where fairytale friends are forced to kill each other in a set limit of time or they would also die" game? 'Cause that's the premise of this game. As a further aside, I spoke with the game designer. They said that during the previous campaign they decided to redesign their logo (or that was the plan all along). This is in the process of changing, but they decided to keep the old logo for the 2nd campaign for the sake of continuity. So don't worry, it won't be published like this. I'd imagine it'll look more like the Marvel logo (above), or be something completely different. You use the word "redesign" implying they designed something originally. Which they clearly didn't. They copy pasted. Sigh. So removing the original BR, putting in the bird, having it match the previous design, and adding their title over it involved no thought process at all? Regardless, it seems to be a moot point as they are creating something that hopefully you will consider as being "designed." I think you should care because if they are in the middle of production and they get sued and aren't allowed to finish the product all the backers will lose there money. My concern is they are in a second Kickstarter, and the first Kickstarter isn't even produced. How much of our money are they going to take before they actually make something? Has anyone physically seen any of these games? There are enough lawyers making game loads off this already, do the rest of us really care or need to get involved? If I was going to get this caught up on who borrowed/parodied from who I'd have to ditch half the crap I own. Not only is the logo ripped off, but the Fairytale theme is pasted blatantly on the plot mechanics of the movie. I would think Battle Royale would be used to folks copying their work, look no further than Suzanne Collins' monstrously successful Hunger Games. What I find hilariously ironic is that a case could probably be made that this game infringes on both, with the logo strikingly similar to Battle Royale and the Mokingjay design used through almost all of The Hunger Games' marketing. "Go big or go home" I guess.